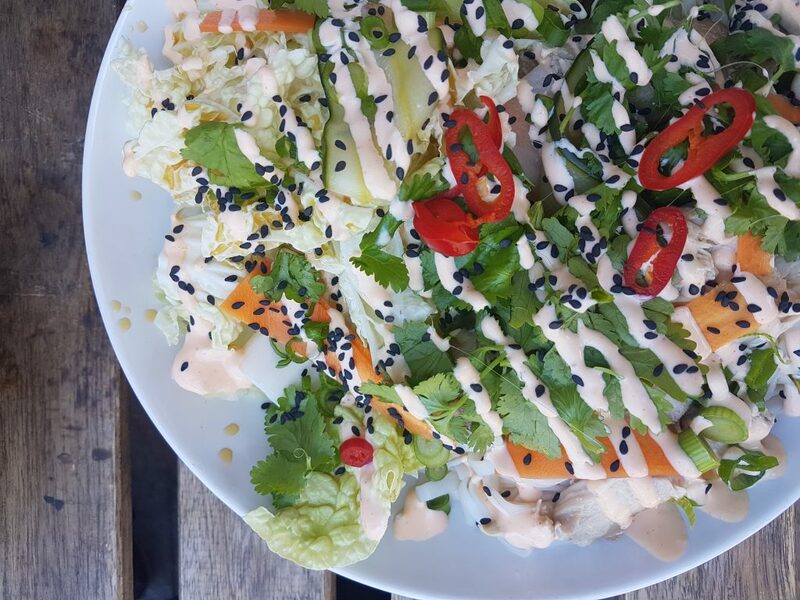 Broadway Market in East London hosts a whole haul of fantastic independent restaurants, as well as a weekly Saturday food and crafts market. It happens to be local to me and I have spent a lot of time there over the past few years discovering the gluten free Broadway Market gems. Time for me to share my gluten free tips and suggestions with you all. The market makes for a perfect Saturday wander, with gluten free lunch or cake thrown in, and the pubs and restaurants that line the street with keep you happily occupied all evening. Let’s take a look at the market’s gluten free options first, but scroll on down to the bottom of this post for the restaurant suggestions. 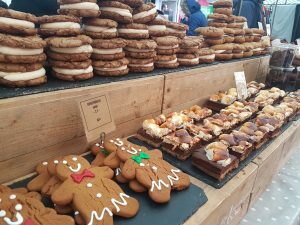 Having gathered a lot of knowledge through my weekly “research trips” (*ahem* cake eating excursions), I wanted to share my top tips on where to eat, snack and shop at the market if you are gluten free. Gluten free smores cheesecake – the stuff of dreams and you wouldn’t be able to guess that it’s gluten free. Fab red velvet cake and cookie sandwiches plus so much more. They also do a wonderful gluten free seeded loaf that freezes well if you don’t manage to eat it all while it is still fresh. Gluten free cakes, gluten free pastries and gluten free bread galore, this is a must visit for you coeliacs. Eclairs, doughnuts, spinach and feta squares, crusty baguettes – Floris Foods have them all. I am a big fan of their olive baguette, and in the summer they often have lovely sandwiches that are perfect for picnic time at the lido. Gluten free coconut pancakes, which are also vegan. I haven’t tried these guys yet but they are on my list! Find them at the top of the main market. Malaysian curries – I love the beef rending from Makatcha with a side serving of peanut sauce. Serving up sizzling pad thai, which is gluten free and so so tasty. Usually found at the bottom of the market. A fully vegan and gluten free stall. Their products are also free from dairy, eggs, wheat, soya, additives, preservatives and refined sugar. Definitely takes the prize for Prettiest Broadway Market Stall, the Meringue Girls stall has been going for a few years now. Pick up some rainbow “unicorn poo” or one of their large flavoured meringues. Check out their cook books while you are browsing – I have both and I love their creative recipe suggestions. 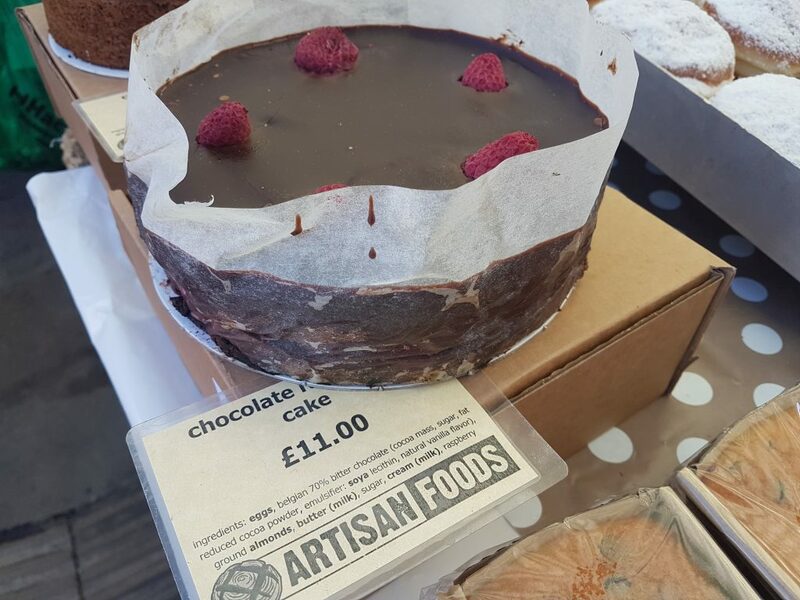 Artisan Foods do an amazing gluten free chocolate and raspberry torte (best to buy a big one…I worry about cross-contamination with some of the presliced pieces). If you are looking for cake-for-one, they do individually wrapped pieces of chocolate mandarin loaf, packed with chunks of real orange and dark chocolate drops. A 2017 addition to the market, to be found in the schoolyard part of Broadway Market. This stall often has lots of gluten free options (cakes and some savoury treats) and they assured me that their manufacturing processes do not risk cross-contamination. This Persian food stall does a fragrant and delicate Saffron Orange Chicken stew – try it, it’s ace. Fabulous Indian food from Kally Cooks. They have lots of gluten free options and the food we tried really was fantastic. When we visited it was fully gluten free, but check before you order as the menu does vary. Gluten free bao buns, wahoo! 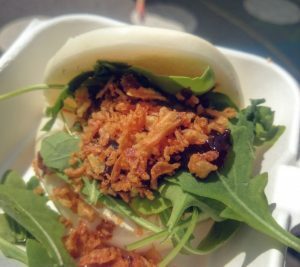 Look out for the big “gluten free bao” sign and you’ll be rewarded with spicey pork confit or goats cheese and caramelised onion gluten free buns. This stall isn’t always at the market, but when it is it usually pops up in the school yard part of the market or in Netil Market along the road. 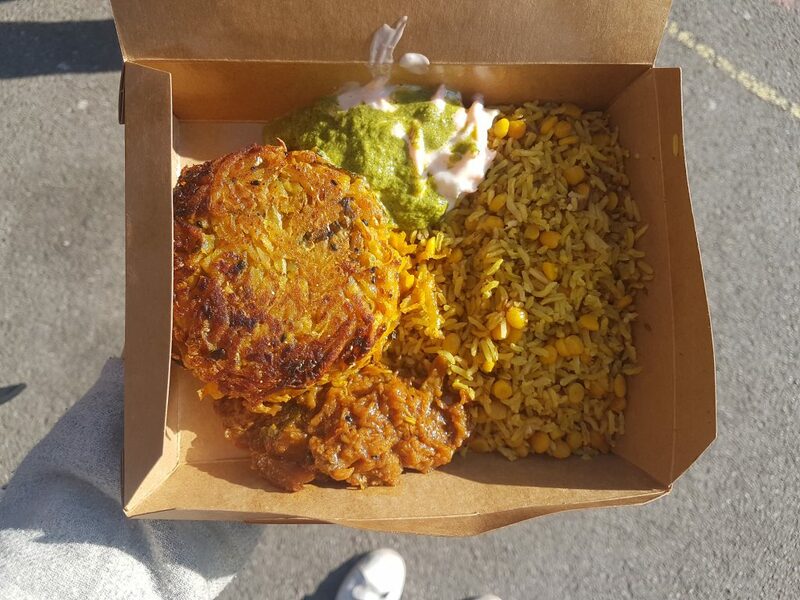 Lots of gluten free options on this Gujarati Rasoi food stall, including these impressive-looking bhajis. 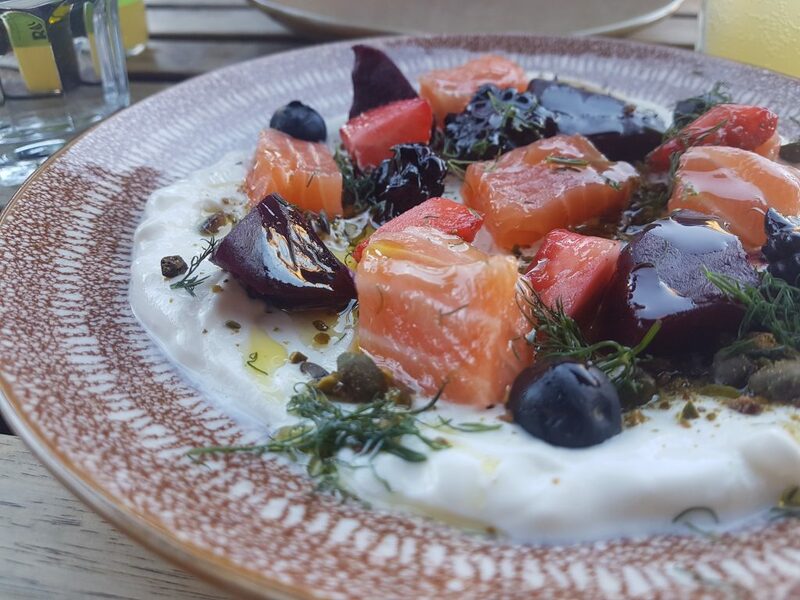 They also have a Dalston restaurant if you like what you taste! 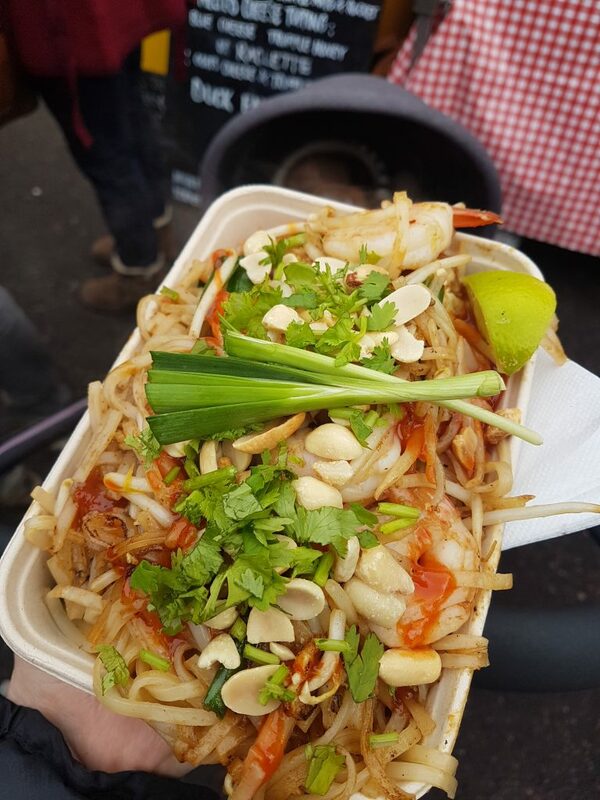 Hanoi Kitchen has super helpful stall holders who can adapt some of the Vietnamese fare on offer the make it gluten free – just ask. For the rice noodle boxes with pulled pork, then just omit the soy sauce topping. Paella is nearly always a good coeliac option, and the paella stand in the school yard confirm theirs is suitable for us gluten freers. It’s dairy free as well! 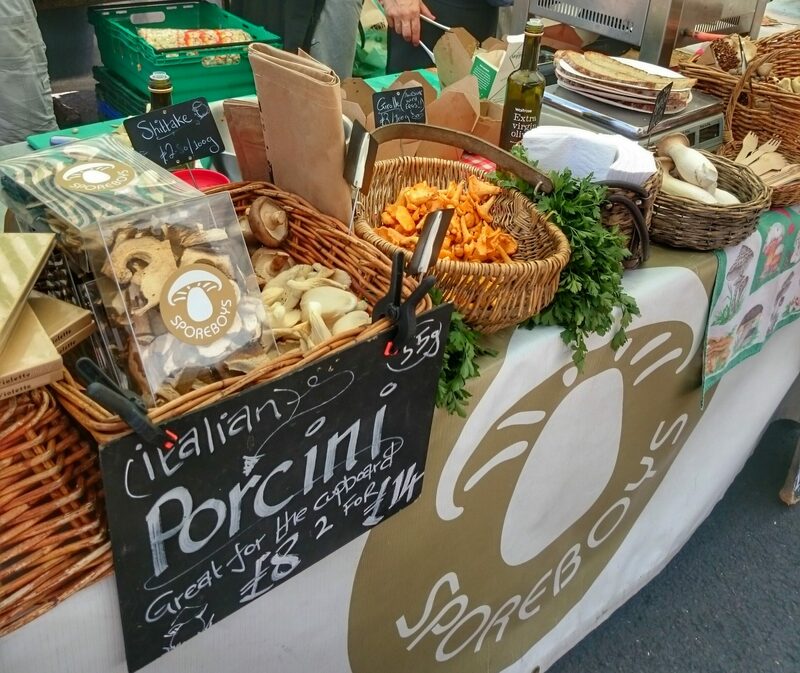 First, the truffle oil smell emanating from the Sporeboys stall will draw you in. Then watch as they fry up fresh mushrooms to mix in with their premade risotto and you will be hooked! Best to get this one early as it often sells out. Not a hot food option, but Temaki do gluten free sushi that will definitely constitute a decent lunch! Gourmet jams and chutneys from the lovely Kylee. 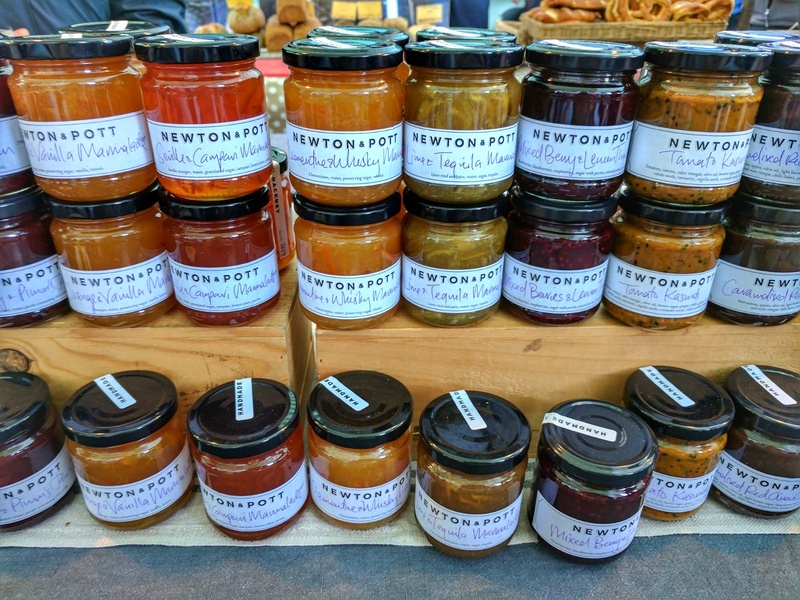 The majority of Newton & Pott‘s range is gluten free and she will be able to answer all your dietary requirements questions (she certainly did a great job at answering all of mine!). Check out her cook book – The Modern Preserver – for some innovative recipe suggestions and to try your hand at some of her jam recipes. Apple juice many ways (with rhubarb, strawberry, pears, elderflower) from family-owned farm Chegworth Valley at the top of the market. These juices are lovely as a standalone, but also make for perfect cocktail ingredients. This also sells lots of fresh produce. A few gluten free varieties to be found. 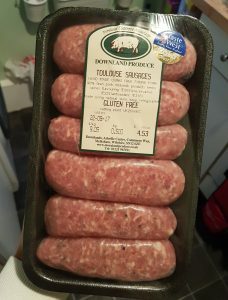 My absolute all time favourite ones are the Downland Produce Toulouse sausages (big meat stall in the middle of the market). 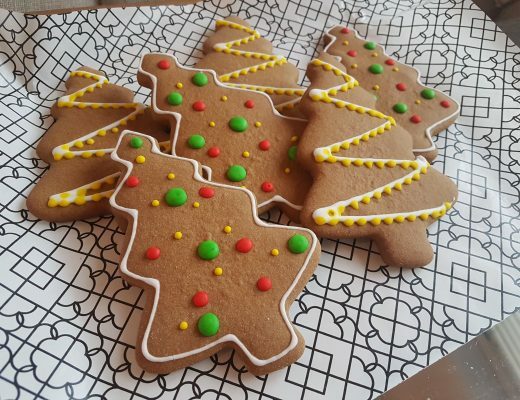 They taste amazing! Truffles as far as the eye can see. The Dark Sugars chocolate stall does some brilliantly innovative chocolates (pipette of mango puree, anyone?) and decadent truffles. When I spoke with them, they confirmed all their chocolates were gluten free, but please do check before you buy in case they have made any changes. Not my cup of tea personally, but if you are a scotch egg fan I hear Finest Fayre’s gluten free ones are good! For you paleo peeps, there’s Rolla Granola. Really nice gluten free granola that isn’t overly-sweet and is made with lots of good stuff. I love their savoury granola “Neanderthal Nibbles”, which gives a wonderful crunch sprinkled over an avocado-packed salad. Lots of varieties of olives, dips, sundried tomatoes and other goodies available from Borough Olives in the middle of the market. Gluten free macarons and macaron ice-cream sandwiches from the L’Orchidee stall that sometimes pops up at the market in the summer. 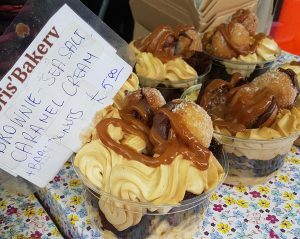 For practical details about where the market it and the specific times it is open on Saturdays, please check out Broadway Market’s website. Buckwheat galettes available here, but he also does gluten-containing crepes so I have some cross-contamination worries. 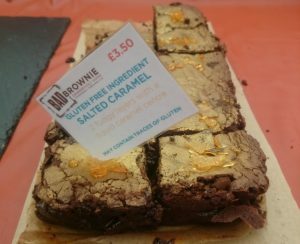 Epic salted caramel chocolate brownies – although they have recently added a “may contain traces of gluten” warning, so coeliacs consume at your own discretion. Lots of lovely-looking fudge and some gluten free varieties from Get Fudged. Note, however, that they also do non-gluten free flavours so coeliacs may wish to steer clear. 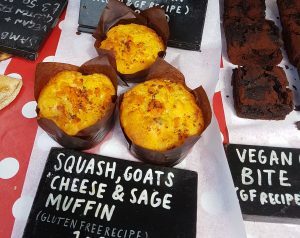 I’ve spied gluten free cheesecake and savoury goodies on the Popina stall, however they sometimes have some cross-contamination issues going on with their non gluten free products. Worth having a look to see whether the layout of the day is coeliac friendly or not. 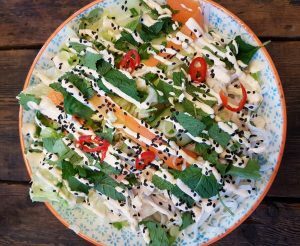 Delicious noodle bowls that can be done gluten free, just let them know your dietary requirements. They also offer gluten free rice waffles at breakfast time. A specialist beer pub, they have a number of gluten free beers choices in their range. The Dove also does great food – they’ve rustled me up gluten free fish and chips in the past and their thai food is very good too. Last time we visited their menu was marked up with “GF”. 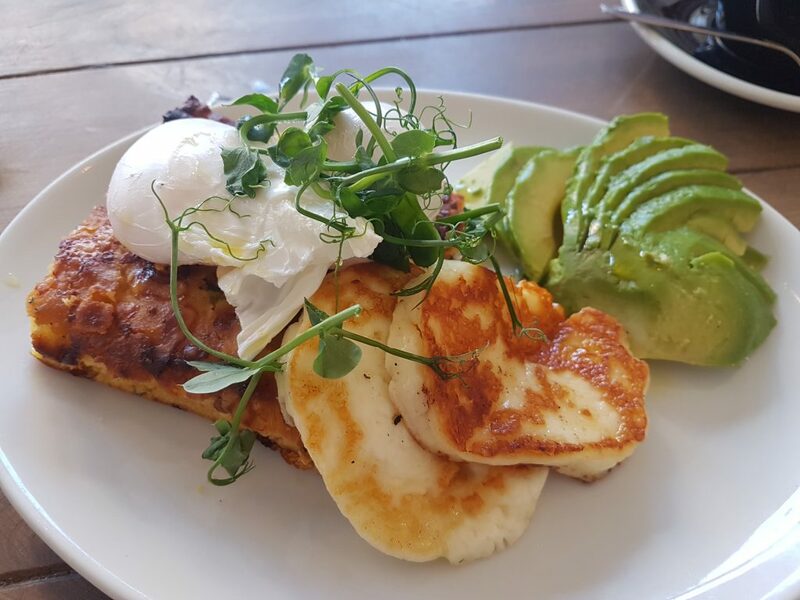 The Bach has plenty of delicious gluten free brunch and lunch options. Ricotta, figs and honey on toast – yummy! With a coeliac owner they pay a lot of care to cross-contamination issues. They have dedicated tongs for the gluten free cakes and the menu is marked up with GF options. Tell them you are coeliac when you order so they know to take the required precautions in the kitchen. On the bridge over the canal at the bottom of the market, this new restaurant wowed us with their fabulous small plates. They were very accomodating to me as a coeliac, and staff took a lot of care to ensure my food was gluten free. Many dishes were naturally gluten free but they also readily adapted others to make them suitable for me. 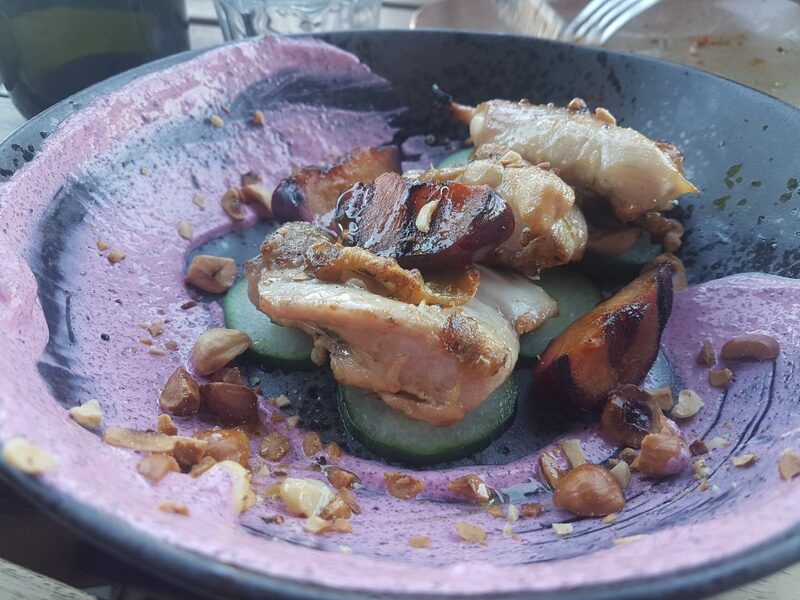 This tapas restaurant has a wide range of gluten free dishes available. El Ganso‘s menu isn’t marked up but staff were really helpful and told us what was coeliac safe. Get a jug of their house sangria to wash it all down! 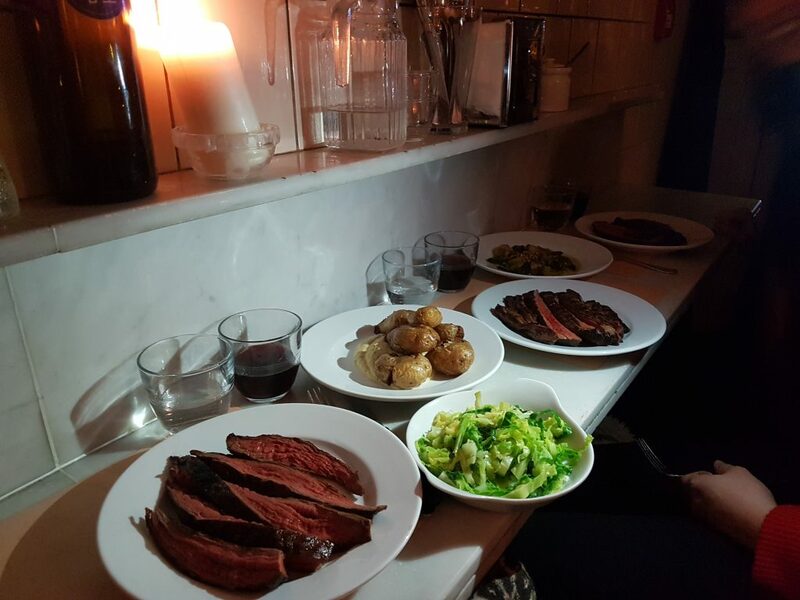 A butchers by day and restaurant by night, this certainly isn’t a spot for vegetarians or vegans as meat is the star of the menu. The menu changes daily and the meat is organic and top notch. They were helpful at catering for me and most of the menu was naturally gluten free. Great wine too. A specialist tea shop that does a great chai tea latte and often has gluten free cake on sale. They have various food residencies here and sometimes are fully gluten free, depending on the month. 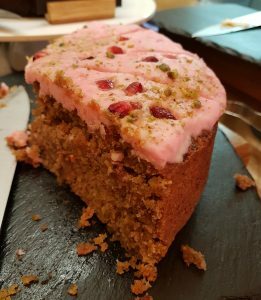 La Bouche cafe has lots of lovely deli items on sale, plus gluten free cakes and other gluten free products on their shelves. 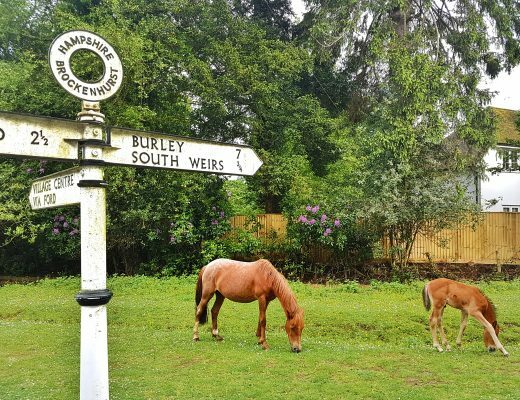 A great place to stop for a coffee. An Argentinian steak restaurant with juicy juuuuicy steaks, Buen Ayre has an allergen menu to show you what is and what isn’t gluten free. Japanese food with various gluten free options, all marked clearly on the menu.